Do you leave your dog at home each day while you go to work? Is your dog alone during the hottest part of the day? It’s essential that your dog doesn’t overheat during the summer months. 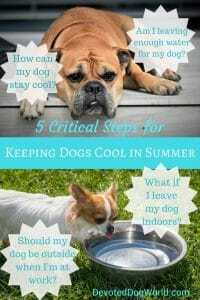 Here are the 5 critical steps for keeping dogs cool in summer heat. Check Today’s Price on this Dog Pool. It’s easy to drain and portable to take with you to keep your dog cool. 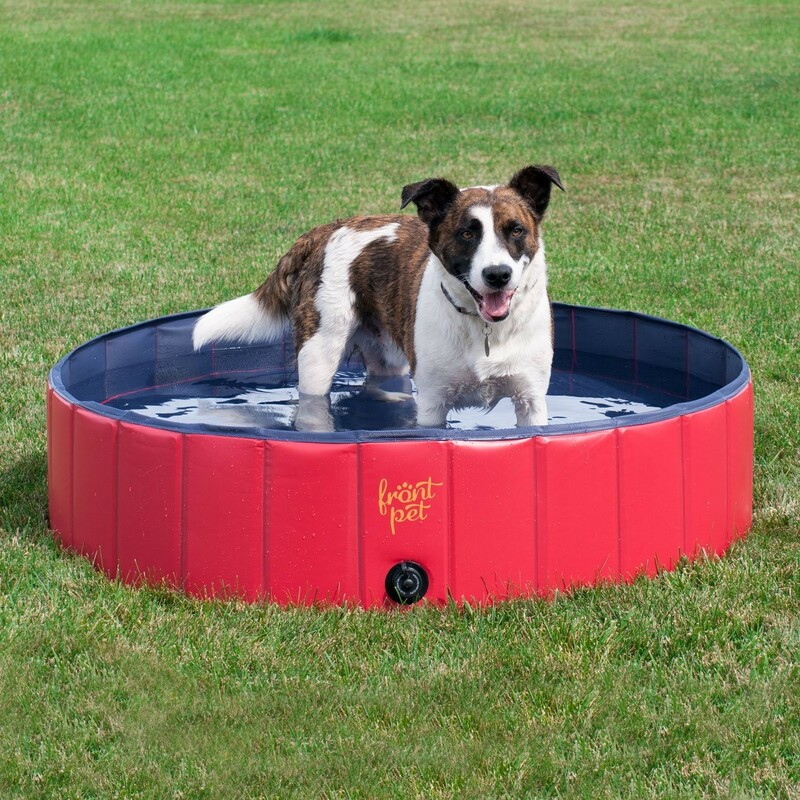 You need to set up your home or garden in a way your dog can keep cool even when you’re not there. Here are the steps you should take to ensure your dog is safe and comfortable when you’re not around. Keeping dogs cool in summer is easy if you plan ahead. Whether you buy a couple inexpensive items or a large dog pool, you’ll make a difference by adding multiple ways for your dog to cool down. Just like a human, it is essential that your dog gets enough water each day. During the heat your dog needs more water so as not to dehydrate. If your dog is very active and gets a lot of exercise it is critical that you provide enough water. Keeping dogs cool in summer means lots of drinking water. When you’re not at home you can leave water bowls filled for your dog. However, if your dog is boisterous and there’s a chance of the water getting knocked over, you need to provide another source of water. It’s prudent to provide several ways to access water on your property so your dog has options if one source is not available. For example if your pup can’t get back into the house for some reason, it’s a good idea to have water accessible outside. 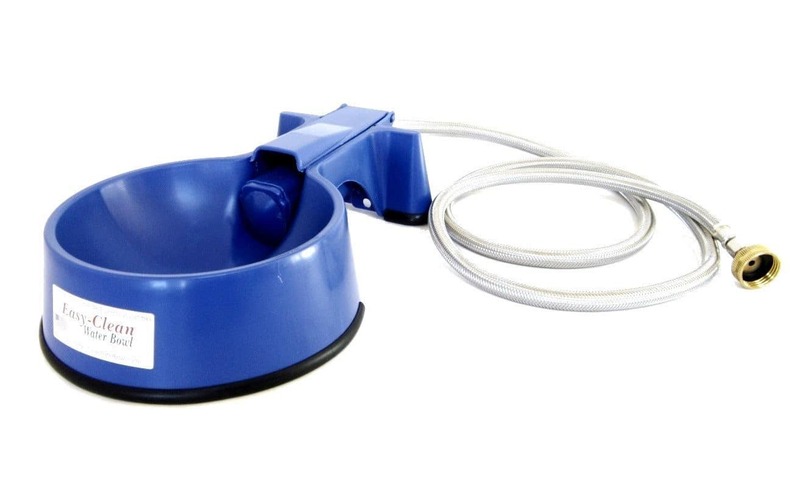 An auto-fill dog bowl is a great idea to keep topping the water up from an outside tap. However, as already mentioned, similar to an ordinary bowl, the bowl itself needs to remain upright for it to be able to fill. ☑ Check the price here for this Dog Faucet Waterer (see image on right). For a few dollars you can get a dog faucet waterer to attach to an outside tap. These water dispensers are easy for your dog to use and you get bang for your buck. Your dog can lick the end of the waterer and gain access to your tap without the tap dripping or releasing water when it’s not required. These are really handy to have outside. A bit more expensive are the dog water fountains. 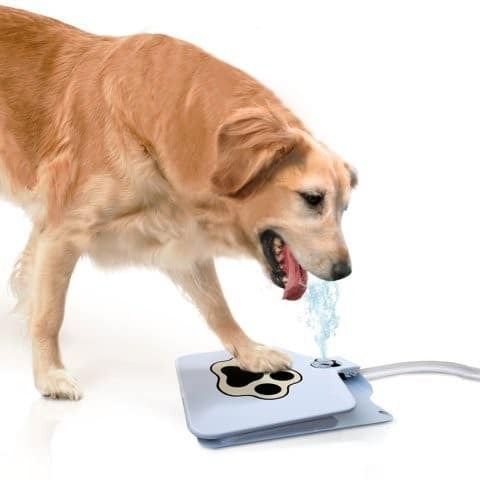 Your dog can learn to activate a water fountain by placing his or her paw on the activator pedal. Whether your dog is inside or outside during the day, he or she will need a cool place to rest. One of the tricks to keeping dogs cool in summer is lots of shade and keeping them away from hot airless spaces. If your dog likes to sit on the back deck, make sure there’s enough shade during the hottest part of the day. If your pup is inside, you’ll need to make sure there’s somewhere cool to sit and relax. An elevated cooling dog bed can be used inside or outdoors. They’re easy to pick up and move around if you need to. These dog beds allow air to circulate which helps to keep your dog cool. For extra shade, you can buy an elevated dog bed with a canopy. Elevated dog beds come in lots of different sizes to suit the needs of your dog. They even come in a variety of colors to suit your decor. Some of these dog beds have a mesh panel in the center and others are completely mesh across the entire fabric part of the bed. One of the easiest ways for your dog to cool down is in water. Have you considered getting a dog pool? If you’re serious about keeping dogs cool in summer heat, then water is the answer. Some dogs like to put their front paws in the water and other dogs like to jump in completely. You can put your dog’s favorite balls and toys in the water too. You don’t need a large pool for a dog, but most people like to get a dog pool large enough for their pup to lie down in it. There are various sizes available. You can get collapsible dog pools to put away during the winter. There are also more durable solid plastic dog pools that are sturdy and are better at withstanding wear and tear (see picture below of bone-shaped dog pool). Have you heard about self-cooling dog mats? These products are amazing and really helpful when you’re keeping dogs cool in summer heat. 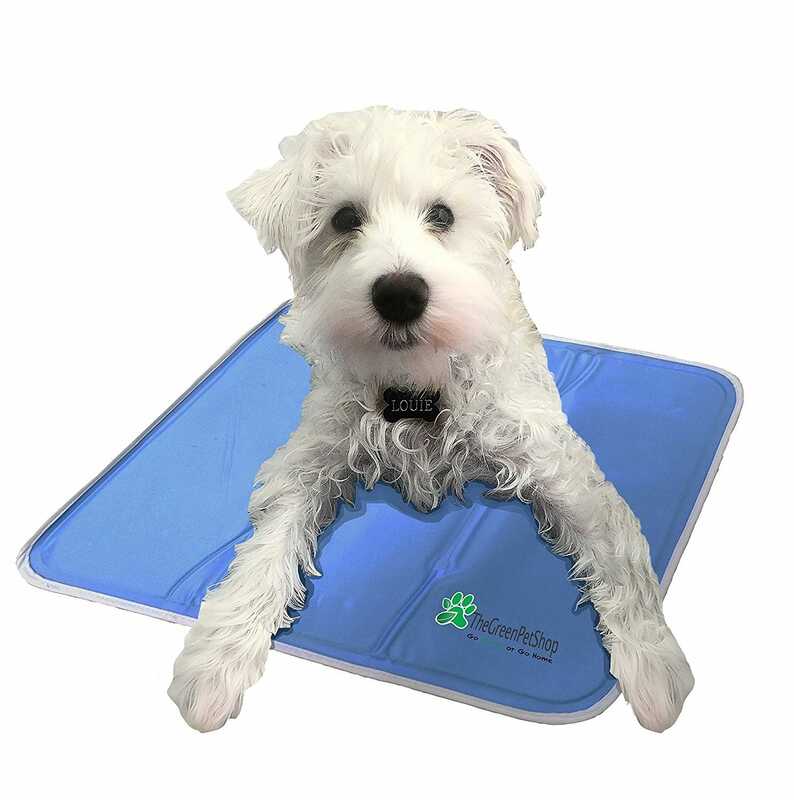 It’s a gel filled mat that is automatically activated by weight as soon as your dog sits down in it. There’s no refrigeration, water or electricity needed. The cooling dog mat stays cool for up to 3 hours of constant use and then it automatically recharges after 15-20 minutes of non-use. The mat is light-weight, foldable and wipes clean. You can easily take it with you in the car. These mats can be used on the floor, in crates, on beds, indoors or outside. 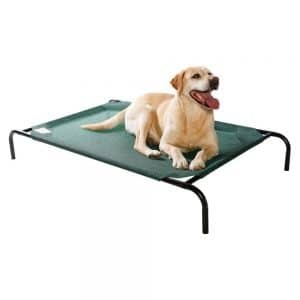 ☑ Check the current price on this Cooling Dog Mat. 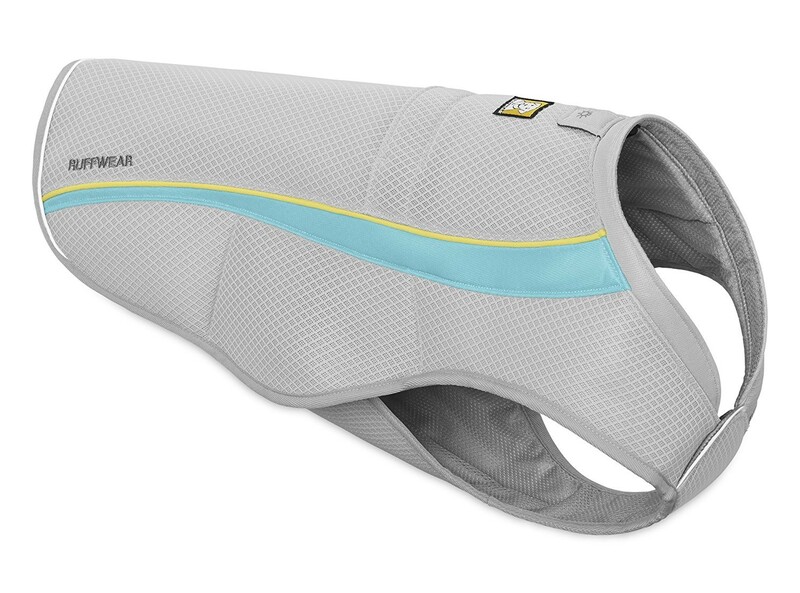 Have you tried a cooling vest for dogs? These cooling vests use evaporative cooling to help your dog stay several degrees cooler while wearing the vest. The vest needs water on it before you put it on your dog. Some people put the vest on their dog and then hose them down to make it wet. If you have dogs that are running around, these vests are great for keeping dogs cool in summer months. These vests work very well if your dog is running around outside. The evaporative effect works to lower the temperature near your dog’s skin just like a human’s sweat creates an evaporative cooling effect on the skin. A dog cooling vest will usually keep cool for several hours. As long as you can keep making it wet it keeps cool. If you’re not able to keep wetting the vest, you wouldn’t want to leave it on your dog for too long. And certainly, you couldn’t leave it on all day. But it is very effective for a few hours outside. At first, this may not seem to fit the bill when we’re talking about keeping dogs cool in summer heat, but bear with me, especially when it gets to the subject of air conditioning below. If you’re leaving your dog alone all day it’s a good idea to own a pet camera (like the one pictured). With so many available these days, it’s easy to find one that suits your needs and your budget. 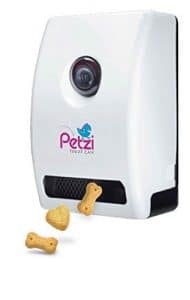 If you’re looking for the best Dog Cameras with Treat Dispensers click here. There are high-end cameras that also dispense treats via your smartphone. 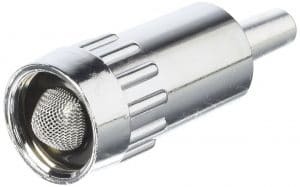 While these are great fun and they put a smile on your face, you don’t necessarily need to spend that much money to get a dog camera. Even a basic wifi camera will do a great job if you need to check on your dog while you’re at work (see below). 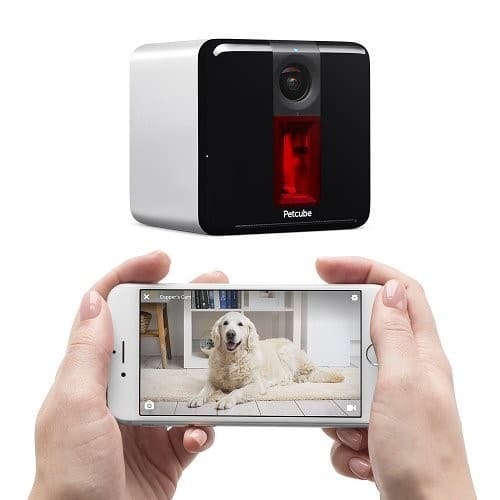 The Petcube dog camera (see today’s price on Petcube) is also really popular and has great reviews. It includes a laser game of tag so you can interact with your dog while you’re at work. During the heat of summer you may leave the air conditioning on in your house for your dog during the day. If you are relying on air conditioning, it’s wise to either have a pet camera to monitor your dog or have a system to monitor the air conditioning itself. 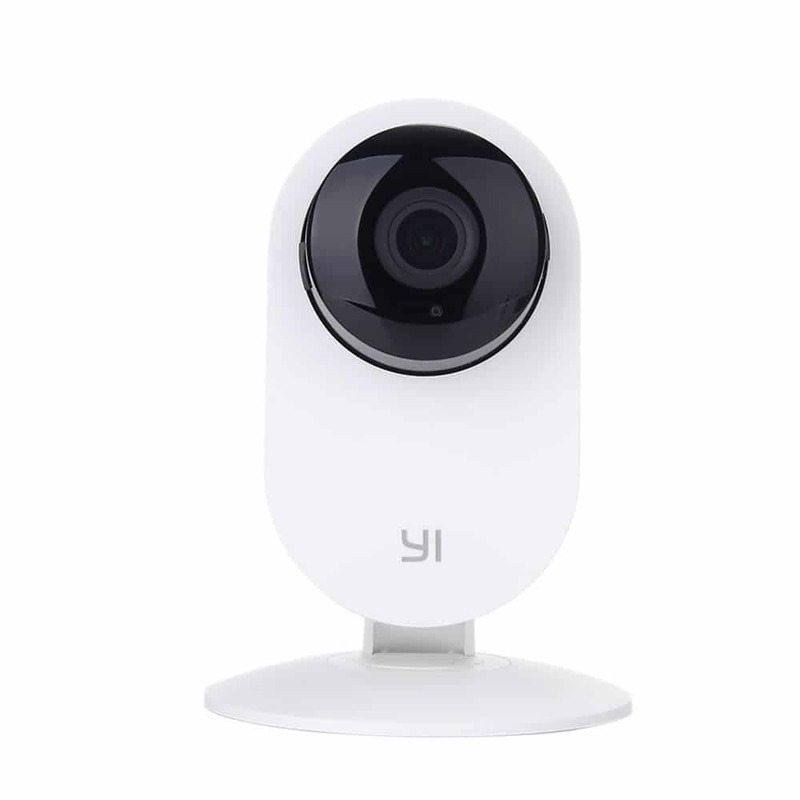 You might have a smart home monitoring system. If the air con thermostat fails or there is a power outage or some other problem, your dog will be suffering from the heat. If you are relying on air conditioning for your dog, it’s best to have a backup plan that your dog can implement in a time of need. For example, can your pup get outside through a pet door and then cool off in a pool of water? 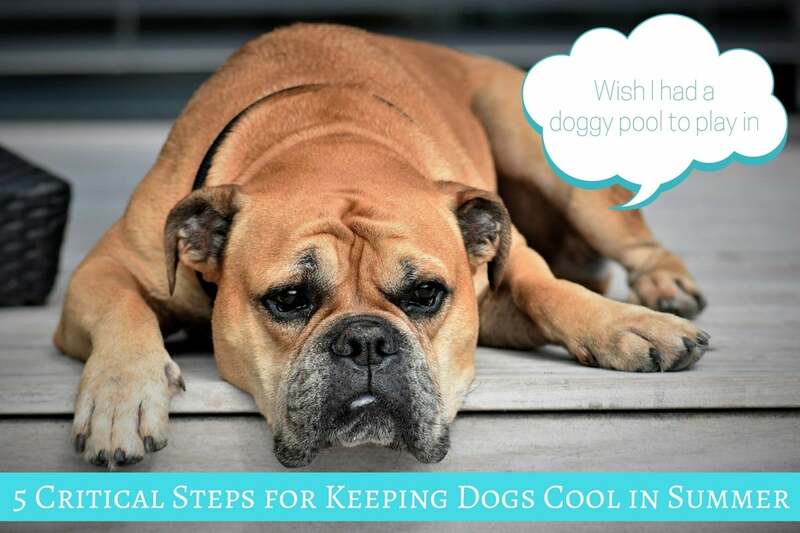 When it comes to keeping dogs cool in summer heat, you really need a contingency plan. If you have a means of monitoring your dog during the hotter months, at least you’ll be alert to the problem sooner than the end of your day at work. That way you can get home sooner and rescue your dog should the air conditioning fail. 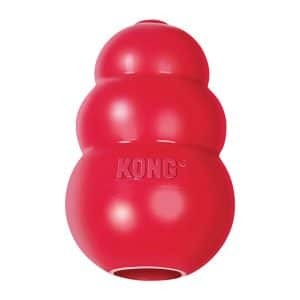 When you leave for work, give your pup a kong with his or her favorite treat inside. But freeze it. Here is a link to the current price on the classic Kong toy for frozen treats. In hotter weather your dog will love playing with a frozen treat. You can leave an extra one somewhere different for your dog to find later. Frozen treats keep your dog busy and help him or her to cool down. They’re also great for coping with separation anxiety if your dog frets when you leave. Frozen treats are a great way of keeping dogs cool in summer so if you’re out all day you could even consider asking your neighbor to drop a frozen treat over the fence to your pup during the day, if they’re willing to help out. The more cooling items you can provide, the better your dog will be during the summer months. So often dog owners leave for work in the morning when the day is not yet at its hottest, they sit in air conditioned comfort at work and don’t necessarily think about how their dog will cope while they’re away from the house. Keeping dogs cool in summer heat should be a priority. Everyone thinks to leave a bowl of water, but it takes more than that. It’s imperative that your dog has access to a variety of ways to cool down. This is especially important if your dog is older or has any health problems. There are plenty of products available for keeping your dog cool. So even if you don’t have a lake in your backyard you can still provide a dog pool for your pup to splash around in. Enjoy the summer and keep your dog cool even when you’re not at home. This entry was posted in Dog Health on June 29, 2017 by Didi.